New York Tackles Wage Theft Against Immigrants Nearly half of New York City's work force is foreign-born. And labor officials say these immigrant workers are among the most exploited. Now, after what critics call years of neglect, the state's Labor Department is testing out a more aggressive approach to help them. 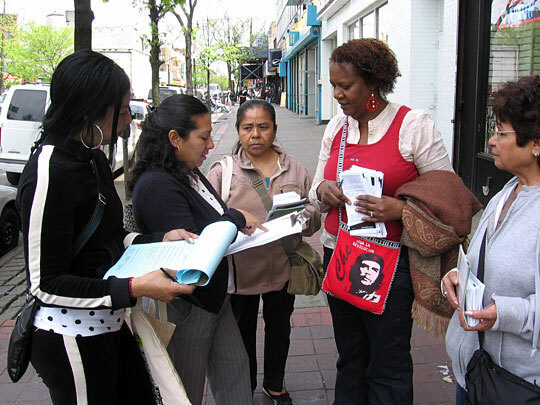 Carmen Calderon (second from the right) and her colleagues with New York's Labor Department travel to ethnic neighborhoods to make sure immigrant workers know their rights under labor law. Nieves Padilla (second from the right) of Make the Road New York and Laura Tapia (second from left) of the Retail, Wholesale and Department Store Union, visit stores in Brooklyn to make sure both employers and employees are aware of labor laws. These activists also seek out tips on possible abuses to pass on to New York's Department of Labor. New York State isn't the only place where critics say past labor enforcement has been weak. In March, the Government Accountability Office criticized the federal Labor Department for sluggish response times and inadequate follow-up. It found some investigations were even dropped after employers didn't return phone calls. On a bustling sidewalk in the Dominican neighborhood of New York City's Washington Heights, Carmen Calderon reaches over a folding table to wave a pamphlet at a sandwich delivery man, shouting in Spanish, "You know your rights as a worker?" The man smiles and keeps biking. But in the course of an afternoon Calderon manages to lure others and deliver her message, part of a new effort by New York State's Labor Department to combat wage theft among this city's enormous immigrant workforce. Calderon says it's amazing what immigrants don't know about: the minimum wage, overtime, lunch breaks or that labor laws apply to them even if they're in the U.S. illegally. Several people stop to confide about bad treatment at work, but want to know if they'll be deported if they complain. Even if they're legal, Calderon says, typically humble immigrants are unlikely to report abuse. "They don't want to ruffle any feathers," she says. "It's like, 'Wow, he's doing me a favor, he gave me a job.' But they don't realize they're being abused by the person supposedly doing them the favor." Faced with such an overwhelming problem, the Labor Department has joined forces with immigrant advocacy groups for what they call "wage watch" — an approach taken straight from the concept of Neighborhood Watches. On a cool evening, four teams of state investigators descend on the tony neighborhood of Park Slope, Brooklyn. They no longer wait to respond to complaints. Instead, clipboards in hand, they're paying surprise visits to 22 restaurants. They scope out any basement exits first and post a member outside; this is in case kitchen workers mistake them for immigration agents and try to flee. At a family-friendly chicken place, one team heads inside and investigator Aristoteles Rodriguez slides his department ID across the counter. "I work for the New York State Department of Labor," he tells the cashier. "We're basically conducting an investigation of your business, and we need to speak with some of your employees." The cashier looks wary and picks up the phone to call the manager. A few customers near the front window don't seem to notice anything. Rodriguez heads to the back bar to start interviewing waitstaff. "Sunday, what time do you come in?" he asks a nervous looking young man. Rodriguez goes through each day of the week, asking about hours worked and then pay. The man says he gets $25 for an eight-hour shift, less than half of New York's minimum wage for waiters. He also works several 12-hour days, but says he gets no overtime. Deputy Labor Commissioner Terri Gerstein has come along on this sweep, something she's been doing every couple of months as the department takes its more aggressive approach. On the sidewalk out front, an employee tells her he is paid in cash and describes a grueling workweek of more than 80 hours. "How many days off do you have?" Gerstein asks. "I don't have time off," he says with a slight hint of indignation. "The only rest I get is three hours at most," once a week. The interview suddenly ends as the restaurant manager arrives, asking, "What's the problem?" Some workers scurry inside while others come out to watch. Gerstein explains they're investigating a number of restaurants in Brooklyn and after a tense exchange takes down his name and hands him her card. Then she adds, "I also just want to make sure you know it's against the law to retaliate against workers for talking to us." The manager, Fernando Tisoc, says his accountant will call to clear up any problems. Later, he tells NPR his workers' tips make up for their low hourly pay. He insists the restaurant isn't breaking any laws, though says he isn't aware of any provision on overtime pay. After the sweep, labor officials will decide which restaurants to formally audit. They used to investigate individual employees' allegations, only to see some workers fired. Now, Labor Commissioner Patricia Smith says her department works hard to protect the identities of those who claim abuse. "So we will go in and we will audit the whole establishment, so that the employer is much less likely to know who, if anyone, complained," she says. The department has also asked for higher penalties against businesses that retaliate. Smith, who took over as New York's labor commissioner two years ago, says that for too long, labor enforcement both in New York and at the federal level was lax. Smith says the challenge isn't only that so many workers are vulnerable immigrants, but that many of their employers are also foreign born and may know little of U.S. labor laws. "I talk to a lot of employers who are in violation of the law," she says. "And when you ask them what was the story they basically say, 'I bought the store from Joe X, and this is what Joe X did and so this is what I did." Smith says education is key, and so as part of the Wage Watch program her department has teamed up with Make the Road New York and the Retail, Wholesale and Department Store Union. Each week local activists in the Bushwick neighborhood of Brooklyn make their own workplace visits, handing out pamphlets on labor laws to both management and workers. They're also on the lookout for possible violations to report to the Labor Department. Nieves Padilla of Make the Road New York says she can gather tips better than any labor department official. She knows this neighborhood, and everyone knows her. "Even if I'm just in a store to buy something, all the managers think I'm investigating," says Padilla. "They say, 'Ah, here's the troublemaker!' They follow me around and try to keep me away from their employees. But the workers know me too, and actually, we have a way of communicating without even speaking." Padilla demonstrates this knack in a health and beauty store, where one employee seems too nervous to talk with her manager nearby. As the woman watches, Padilla strolls into an aisle, slips a workers rights pamphlet between boxes of hair color and then leaves. The employee gives her a smiling glance as she moves to discreetly retrieve the pamphlet. The manager has seen nothing. New York's Wage Watch is just a few months old, and officials say it's too soon to measure success. But the pilot program is set to expand across the state this summer.